Analysis of Conversion Reasons with 1224 Different Laparoscopic Colorectal Surgeries At a Single Institute: How Improvement of Laparoscopic Skill and Refinement of Laparoscopic Instrumentation Perfect the Laparoscopic Colorectal Practice? BACKGROUD AND OBJECTIVES: Conversion rate has been referred as one of the parameters to judge the complexity of laparoscopic colorectal procedure. This study was designed to analyze prospectively collected clinical database on the patients undergoing various laparoscopic colorectal operations at our institute, and aim at identifying predominant reasons influencing the intra-operative decision making on converting a laparoscopic to an open operation and investigating how improvement of laparoscopic surgical skills and refinement of laparoscopic instrumentation changed the technical limitations of the laparoscopy in the colorectal procedures. 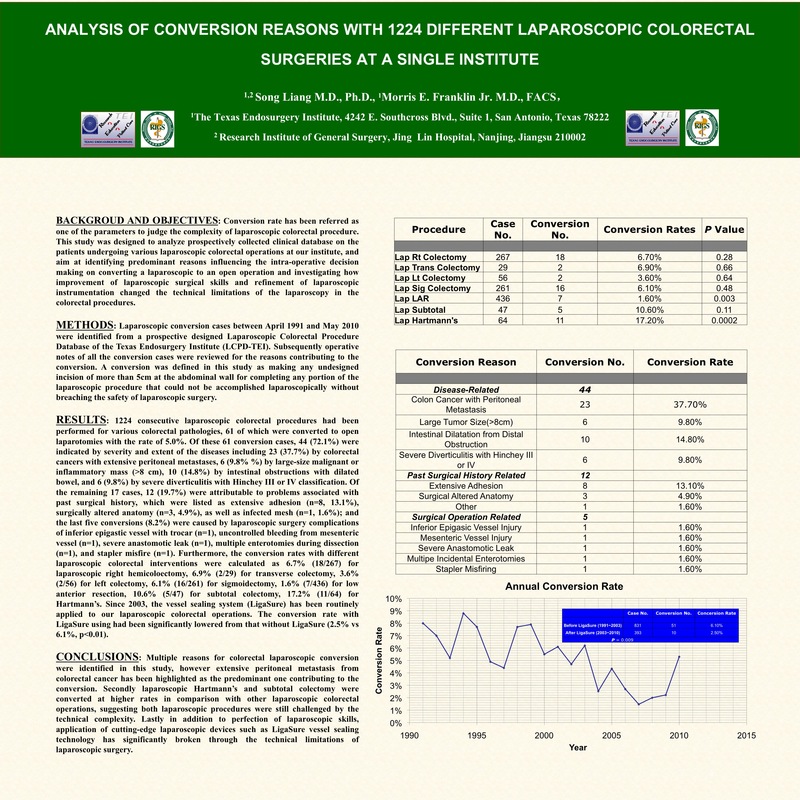 METHODS: Laparoscopic conversion cases between April 1991 and May 2010 were identified from a prospective designed Laparoscopic Colorectal Procedure Database of the Texas Endosurgery Institute (LCPD-TEI). Subsequently operative notes of all the conversion cases were reviewed for the reasons contributing to the conversion. A conversion was defined in this study as making any undesigned incision of more than 5cm at the abdominal wall for completing any portion of the laparoscopic procedure that could not be accomplished laparoscopically without breaching the safety of laparoscopic surgery. RESULTS: 1224 consecutive laparoscopic colorectal procedures had been performed for various colorectal pathologies, 61 of which were converted to open laparotomies with the rate of 5.0%. Of these 61 conversion cases, 44 (72.1%) were indicated by severity and extent of the diseases including 23 (37.7%) by colorectal cancers with extensive peritoneal metastases, 6 (9.8% %) by large-size malignant or inflammatory mass (>8 cm), 10 (14.8%) by intestinal obstructions with dilated bowel, and 6 (9.8%) by severe diverticulitis with Hinchey III or IV classification. Of the remaining 17 cases, 12 (19.7%) were attributable to problems associated with past surgical history, which were listed as extensive adhesion (n=8, 13.1%), surgically altered anatomy (n=3, 4.9%), as well as infected mesh (n=1, 1.6%); and the last five conversions (8.2%) were caused by laparoscopic surgery complications of inferior epigastic vessel with trocar (n=1), uncontrolled bleeding from mesenteric vessel (n=1), severe anastomotic leak (n=1), multiple enterotomies during dissection (n=1), and stapler misfire (n=1). Furthermore, the conversion rates with different laparoscopic colorectal interventions were calculated as 6.7% (18/267) for laparoscopic right hemicoloectomy, 6.9% (2/29) for transverse colectomy, 3.6% (2/56) for left colectomy, 6.1% (16/261) for sigmoidectomy, 1.6% (7/436) for low anterior resection, 10.6% (5/47) for subtotal colectomy, 17.2% (11/64) for Hartmann’s. Since 2003, the vessel sealing system (LigaSure) has been routinely applied to our laparoscopic colorectal operations. The conversion rate with LigaSure using had been significantly lowered from that without LigaSure (1.1% vs 7.9%, p>0.01). CONCLUSIONS: Multiple reasons for colorectal laparoscopic conversion were identified in this study, however extensive peritoneal metastasis from colorectal cancer has been highlighted as the predominant one contributing to the conversion. Secondly laparoscopic Hartmann’s and subtotal colectomy were converted at higher rates in comparison with other laparoscopic colorectal operations, suggesting both laparoscopic procedures were still challenged by the technical complexity. Lastly in addition to perfection of laparoscopic skills, application of cutting-edge laparoscopic devices such as LigaSure vessel sealing technology has significantly broken through the technical limitations of laparoscopic surgery.